AI-LOCK: A FACE RECOGNITION software that controls access. A FACE RECOGNITION software that controls access. 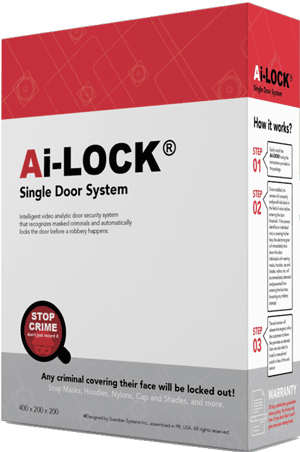 AI-LOCK PLUS at a Glance! A door lock system with a powerful facial recognition software that allows the user to create “whitelist” of authorized personnel for secure access control. It analyzes the faces of every person trying to enter and allows entry only the persons pre-authorized by the user. It allows the user to create “blacklist” or banned individuals to detect and prohibit them from entering your business. It's designed to be incorporated into any type of door and convert it into a secure access-controlled entrance. 600 Lbs. holding force electric magnetic lock with fail-safe NC Mode. Access Control Interface with Whitelist/Blacklist database with 10 profile capacity. AI-LOCK requires a 24-months software upgrade service. Does the Ai-Lock Plus record 24/7? No, but you don’t need to. The Ai-Lock Plus will record an image still of every person that walks into your business. The image is a close-up profile picture that leave no doubt of the identity of the person. You can access these images via any device, phone or laptop by connecting it to the Ai-Lock’s WIFI signal. Will the Ai-Lock Plus slow down my entry flow of my business? No. The Ai-Lock Plus detects personas within 4-5 feet of the doorway releasing the door before a client grabs the handle. The client will not even notice the system. Can I use one license for different access points? You must acquire a license for each access control. Volume discounts are available.